Pick all the fruits from the orchard before the raven steals them. Let your children discover a poetic and colourful cooperative game. The time for picking has come. The Orchard is filled with large, ripe fruits that are just waiting to be picked. But be careful, you must hurry, because a naughty line discreetly glances at your fruits and intends to steal them all. 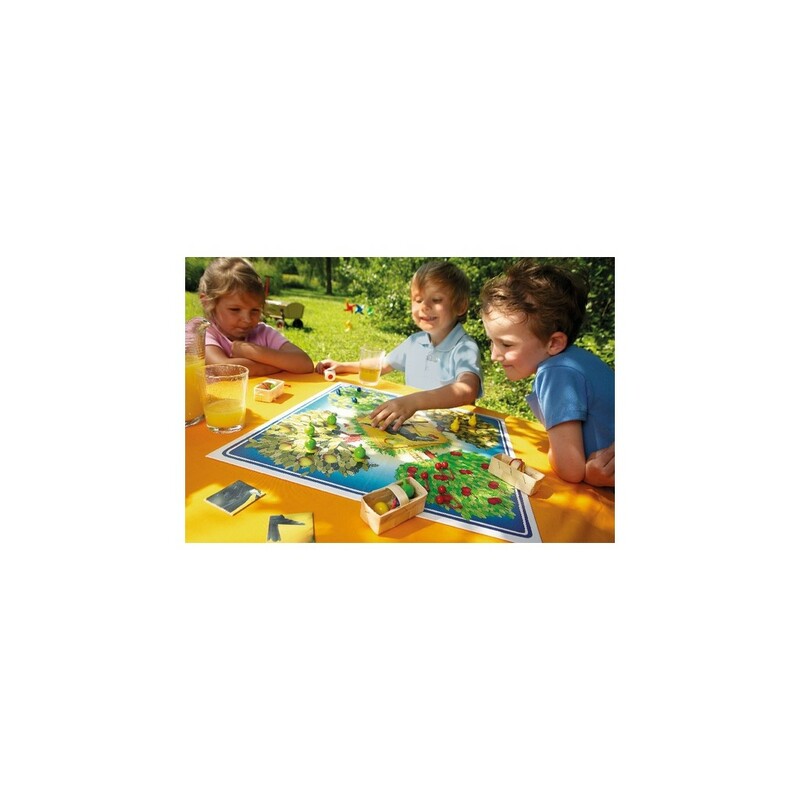 The orchard is a game of dice and cooperation for young children, who must join forces to collect the fruit before the bird. Each turn, roll the dice to try to pick the fruit and then place it in your baskets. The game is won if the children have to collect all the fruit before the raven puzzle is fully formed. Amaze your children with this simple and fun dice game. 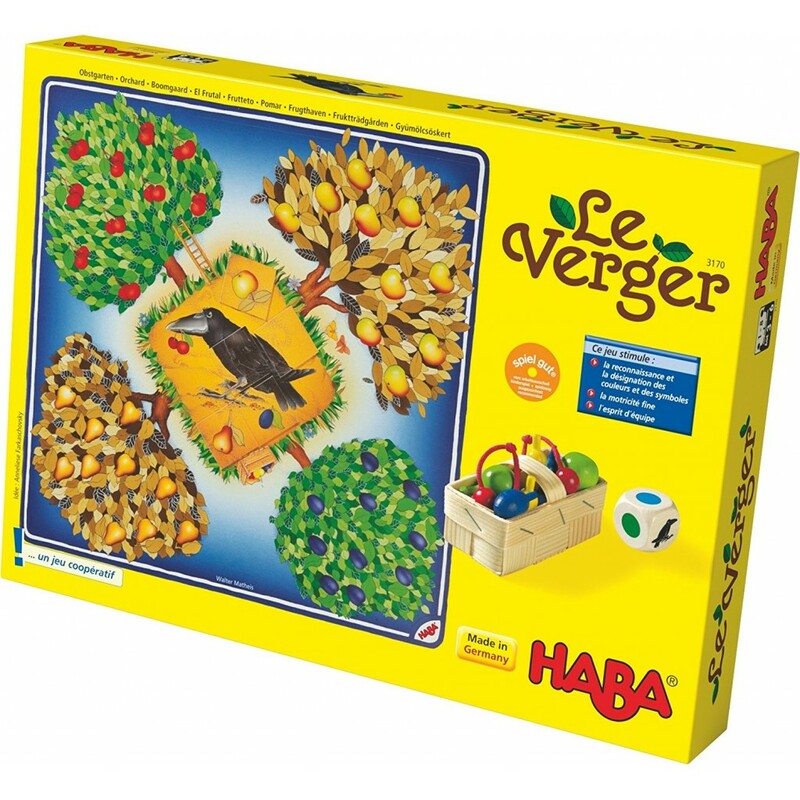 Thanks to a game board with shimmering colours and enchanting tokens, your charming toddlers will be carried away by this precise mission: to take all the fruit before the raven. The orchard, composed of a cherry tree, an apple tree, a plum tree and a pear tree, will become an ideal setting to teach your children about cooperation, mutual help and the concept of the dice. Le grand classique chez les petits. Très beau matériel. Idéal pour la découverte des jeux de société chez les plus jeunes: apprentissage du dé, du "chacun son tour",... Mon fils de 3 ans adore. Super matériel, très chouette avec les enfants ! Un jeu de coopération qui permet d'accepter de nombreux joueurs autour de la table ! Vraiment chouette et apprécié des enfants en ce moment tous les après-midis après la sieste. Génial, mon fils de 3 ans l'adore !